Laptops that are meant to be powerful enough to take the place of a desktop PC tend to be large, space-hogging 15in and 17in beasts. The Chillblast Defiant Mini 13, as its name suggests, is different. This 13in laptop is compact, yet still equipped with the latest technology. What’s more, unlike most laptops, you can have it with Windows 7 or 8.1. The Defiant is boxy and almost twice as thick as any other laptop we’ve seen recently, but then Chillblast has squeezed a lot into its small frame. The 2.4GHz Intel Core i7 4700MQ quad-core processor is one of the fastest we’ve seen in a laptop, so it’s more than powerful enough to take on demanding tasks such as editing Raw images and high-definition video. The 1TB hard drive is large for a laptop and also has a small 8GB SSD built in for speeding up tasks such as start-up and resuming from sleep. As hard drives with even more space become available, you’ll be able to upgrade the Defiant with little fuss. Unscrewing its bottom panel gives easy access to the interior, where you can also boost the 8GB of memory to a maximum of 16GB. 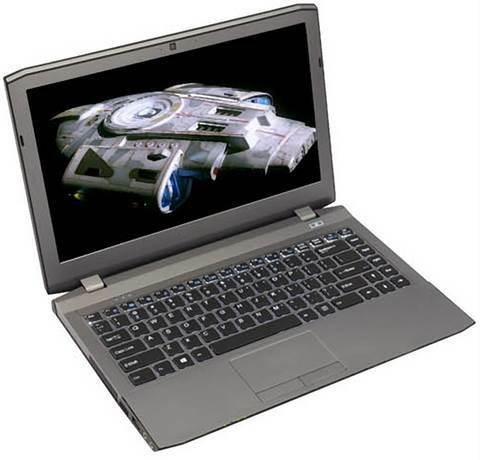 The Defiant also has sufficient power to play all but the very latest games smoothly with display detail settings turned up high, thanks to the fast Nvidia GeForce GTX 765M dedicated graphics chip. It’s not just for games though; some programs, such as Adobe Photoshop, can also run faster using the graphics chip. However, there are downsides to this blisteringly fast performance. Although the Defiant is clever enough to switch from the power-hungry GeForce to a more energy-efficient Intel integrated graphics chip when off the mains, battery life remained modest in our tests at just over three and a half hours. This isn’t really a critical flaw in a laptop designed for use around the home rather than on the move. The underside can become uncomfortably warm when the processor is being taxed, though, such as when you’re editing videos. Typing is fast, accurate and comfortable. The Defiant’s keyboard is one of the best we’ve used as the keys are large and have plenty of feedback and travel. The touchpad is a letdown though, being small and prone to accidentally triggering Windows 8 gestures, such as swiping in from the right to activate the Charms bar. The 13in display isn’t touch-sensitive, but it is dazzlingly bright and image quality is generally of a high standard. The high resolution of 1920x1080 pixels can make text small and difficult to read unless you adjust the display settings. The Chillblast Defiant Mini isn’t perfect, but it’s still a very good choice if you want exceptional performance in a small computer at a fair price.